Contact us Today for All Your Home Comfort Needs! Let Asbuilt Comfort Care take care of all your Heating and Cooling needs! 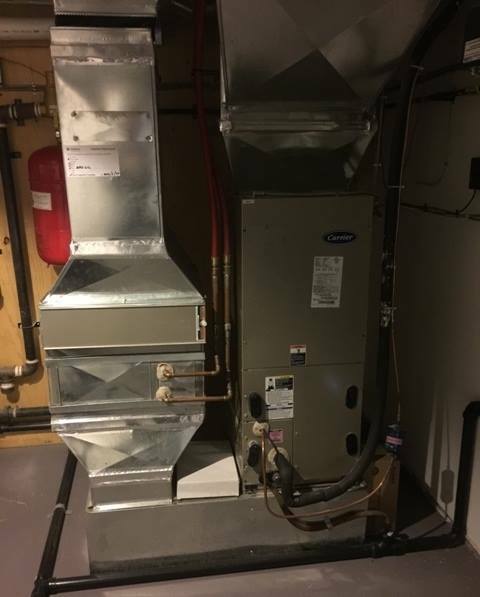 My new air conditioner, Napolean BBQ, BBQ gas line, and furnace repairs, and regular maintenance have all been done with Asbuilt Comfort Care. We have used Asbuilt on our projects time and time again. They provide excellent products and service! They take care with their installs and take time to make sure every detail is addressed. My furnace wasn't working properly so I called Asbuilt Comfort Care and they came out to my house right away to fix it. They are very knowledgeable and offer fast, friendly and reliable service. Not only did they fix the problem, they offered me some great tips on how to keep it running smoothly. I would recommend Asbuilt Comfort Care to all my family and friends. My Napolean Gas Fireplace wasn't coming on, had Asbuilt come in and service it. The technician was great. Did excellent work and figured out the problem quickly. However, the cost of the thermopile that needed replacing was over priced. However, I contacted Asbuilt and they offered me a discount on future work that I require. Very good customer service, personable and willing to help out the customer. Our thermostat would not work and we contacted Asbuilt to service it. 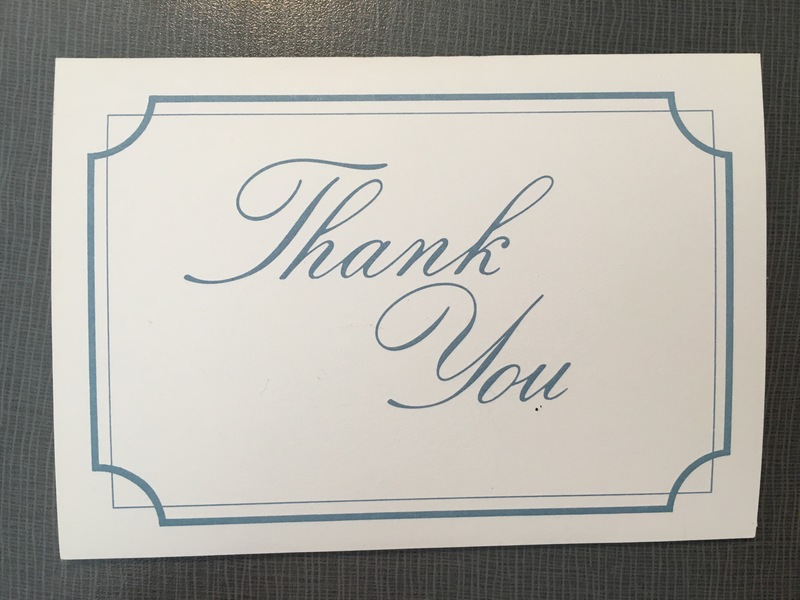 The same morning that we phoned the service technician arrived and not only repaired the thermostat but also tested and made sure that our entire system was functioning properly. From the booking through the service call a very professional and courteous company to work with. Would not hesitate to contact this company again should the need arise. Asbuilt has always given me prompt efficient service with honest pricing. My new air conditioner, Napolean BBQ, BBQ gas line, and furnace repairs have all been done with Asbuilt Comfort Care. I have recommended their services to family and friends who have all been happy with their service. I would highly recommend their business for your BBQ, heating, and air conditioning needs. We were having trouble with our Hot Water Tank, it was leaking .I called Asbuilt Comfort Care and a technician showed up within an hour. They had the old tank out and the new one in within 4 hours . 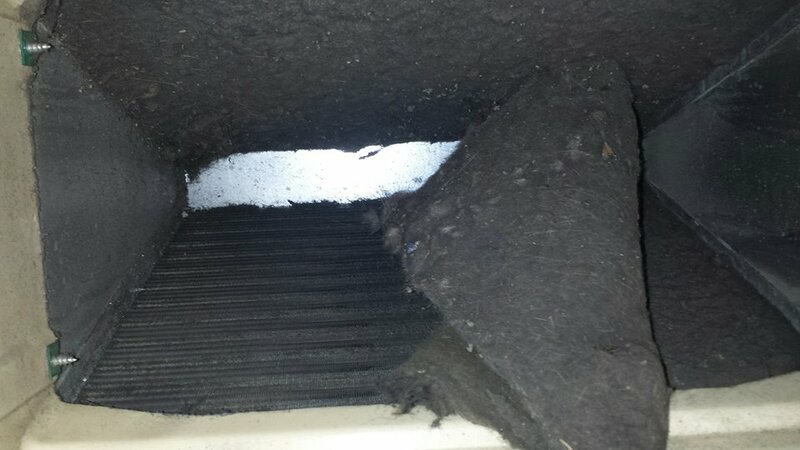 The technicians were very courteous and informative. Would highly recommend this company !! Asbuilt Comfort Care delivers sound advice, professional service and installation of reliable heating, cooling, air quality and radiant heat technologies. We carry products from Napolean Quality Fireplaces, Carrier, Schwank, Rehau and Buderus. As a partner with NextEnergy, we are also building a reputation as a leader in geothermal energy solutions. • Confidence - When you choose Asbuilt Comfort Care, you receive the highest standards of excellence. Asbuilt Comfort Care have all necessary licenses and certifications to deliver excellent service, and customer satisfaction. • Choice - We offer you brand name equipment. We recommend the best equipment for your particular needs. • Convenience - Asbuilt Comfort Care offers accommodating, competitive financing arrangements to assist you with your purchase. • Assurance - We offer quality standards and the best value for your investment. • Commitment - At Asbuilt Comfort Care we are committed to building a long-term relationship with our customers, extending a relationship that is built on trust. • Satisfaction - Asbuilt Comfort Care offers every customer the protection of the Asbuilt Comfort Care Guarantee, which is backed by our company. * Quality service guaranteed * Radio-dispatched service vehicles * Licensed gas fitters * Licensed heating and cooling technicians * Expert design and consultants * Preventive Maintenance Our team of professionals is ready to help you with your needs! We offer: • innovative installation concepts, all customized to meet your specific needs; • the integrity that comes from over 25 years of proven customer satisfaction; • the reliability of reputable products; and • a team of highly skilled technicians who are committed to your family's well-being, 7/24. 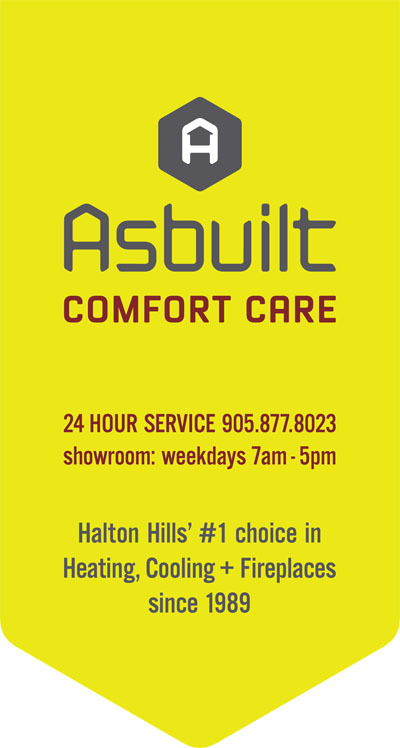 Asbuilt Comfort Care: Voted Favourite Gas and Fireplace Store and a Welcome Wagon Sponsor for over 10 Years. Asbuilt Comfort Care Georgetown delivers sound advice, professional service and installation of reliable heating, cooling, air quality and radiant heat technologies. Asbuilt Comfort Care is proud to be a Carrier Factory Authorized Dealer.Did your know that upgrading your furnace is probably the most effective way to improve your home's energy efficiency and save on heating costs? Napoleon Quality Fireplaces Award Winning Products: Time after time, Napoleon Quality Fireplaces has led the way with new and innovative patented technology. Their products continuously surpass industry standards. Grills | BBQ's: Superior technology, solid performance and balanced design are the hallmarks of a Napoleon® Grills. See for yourself the difference a Napoleon Gourmet Grill makes visit our show room in Georgetown. Subscribe to our Promos and Advice mailing list. Sensi Touch Wi-Fi Thermostat Connected comfort in color. 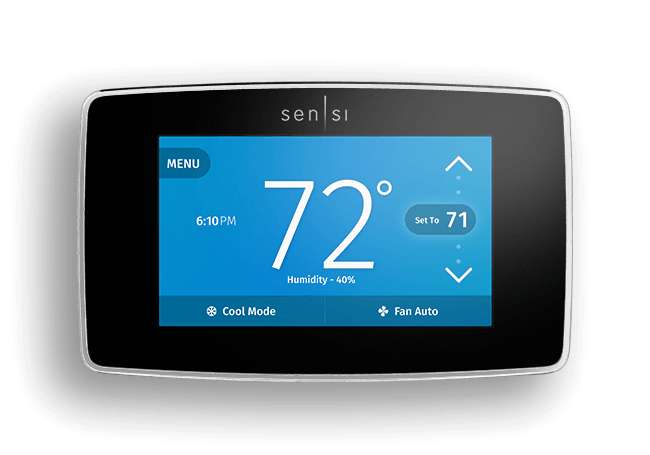 The award-winning Sensi™ Touch Wi-Fi Thermostat makes comfort control easier with upgraded features that are more adaptive to your lifestyle. Book your Preventative Maintenance today ! Since 1989, our company has been committed to customer satisfaction by means of quality products and services, qualified staff, and constant innovation. As widely trusted heating contractors in Georgetown, we specialize in servicing and installing indoor comfort equipment for both commercial and residential applications in Georgetown, as well as the Halton, Peel and Milton regions. Today, we are Total Home Comfort Specialists, providing the best products and solutions to meet your family's unique needs to ensure year-round heating and cooling comfort. Our variety of products and services are sure to address your comfort needs all year round. Since 1989, our company has been committed to customer satisfaction by means of quality products and services, qualified staff, and constant innovation. We specialize in servicing and installing indoor comfort equipment. We offer innovative installation concepts, all customized to meet your specific needs, integrity that comes from almost 30 years of proven customer satisfaction, reliability of reputable product and a team of highly skilled technicians. A natural gas fireplace is more than just an investment in your home and family's comfort. It is the hearth of the home, the place where families gather and create memories. 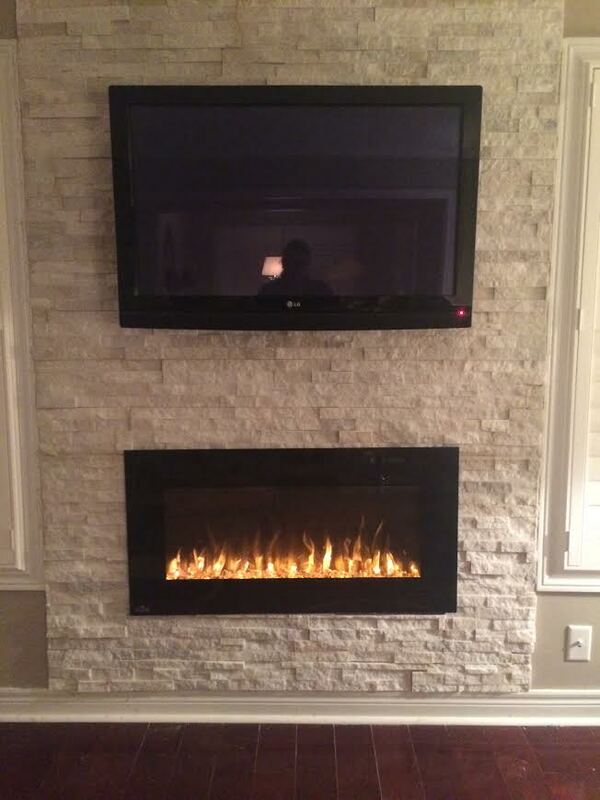 Contact us today to learn more about the ever-evolving fireplace. NO HEAT? No problem! We offer 7-24 hour EMERGENCY SERVICE in Halton Hills and the surrounding GTA Area. We are proud to specialize in the Carrier line of furnaces. Contact us regarding a newer & more efficient model. No Cooling? No problem! We offer 7-24 hour EMERGENCY SERVICE in Halton Hills and the surrounding GTA Area. We are proud to specialize in the Carrier line of air conditioners. Contact us regarding a newer more efficient model.